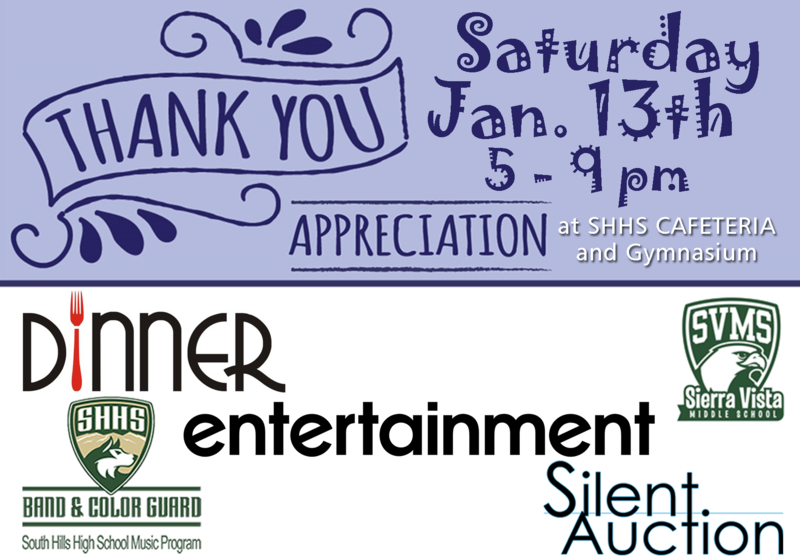 Join us at our Annual Appreciation Dinner and Silent Auction Event, sponsored by South Hills Band Boosters and benefiting the SHHS Band & Color Guard Music Program (100% of the profit for all tickets goes to the student account) ! Bring your friends and family and come mingle with your South Hills and Sierra Vista community for this wonderful event ! 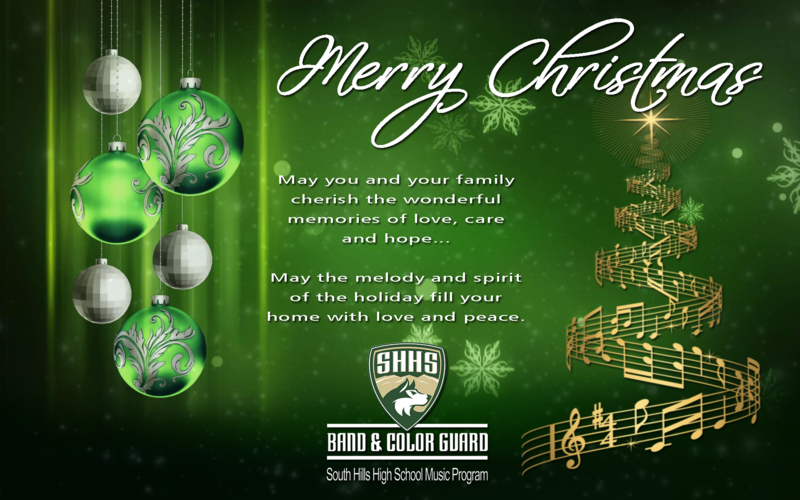 The SHHS Marching Band & Color Guard, Winter Percussion, Winter Guard and Sierra Vista Middle School will be there to showcase their work for your listening pleasure. There will be a fabulous Silent Auction that you wouldn’t want to miss ! Help us spread the word, and if you have donations for the Silent Auction, please let us know ! Dinner Tickets will be sold at the door but not guaranteed. The only way to guarantee yourself dinner is to purchase a DINNER ticket. Otherwise, dinner is based on the size of the purchased ticket and is never guaranteed. Performance are at 6:00 pm and 7:30 pm at the gymnasium. Dinner will be served from 5:00 pm to 9:00 pm at the cafeteria. New year brings to our home new hopes, new ideas and new opportunities to make our lives better. Wishing you strength and determination to achieve what you truly desire in your life. Be safe, enjoy your family being together, and most of all, have fun ! Best Wishes and Happy New Year ! Our Christmas message for you, at this special time of year, may your home be filled with happiness and laughter where memories are made. Good times, good memories and the love of family is one of the best we could every receive. 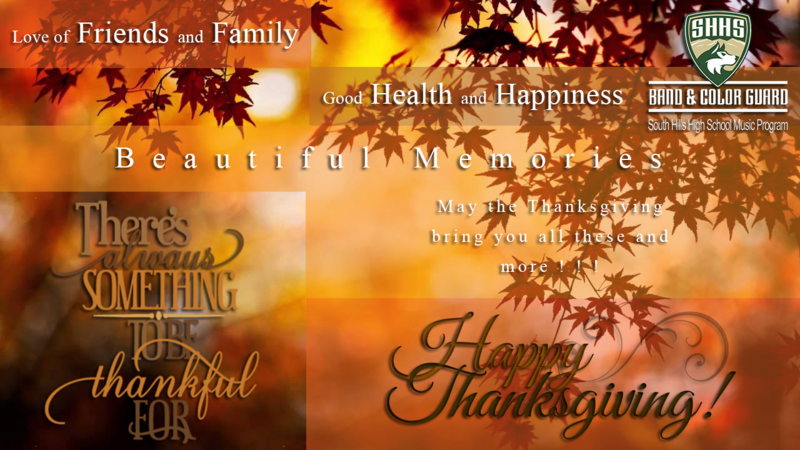 May You and Your Family be blessed and may all the good things of life be yours, not only at Thanksgiving but throughout the coming year. – All students who will be attending Homecoming will be released between 6:15 pm and 6:30 pm. – Parents must come to the trailer to pick up their student. We will not allow the students to meet their ride anywhere besides the trailer. I am responsible for all the students until they are released. Thank you in advance for your consideration. – If you would like your student to depart with another Parent/Adult I must have this request in writing no later than Friday, October 27th. Water, Water and more Water ! Be sure kids come WELL HYDRATED to rehearsal. Starting the day well hydrated makes a long rehearsal day easier to manage. Water breaks help, but coming to rehearsal well hydrated is the key! Sports drinks and water are the best way to achieve this. Please pass this information on to your child.